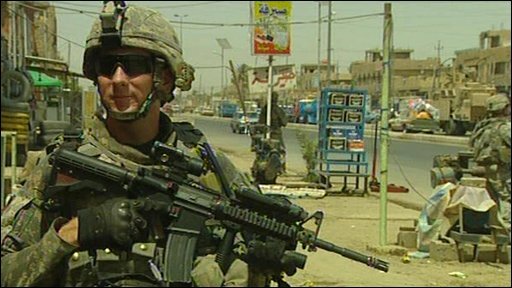 US troops have withdrawn from towns and cities in Iraq, six years after the invasion, having formally handed over security duties to new Iraqi forces. A public holiday - National Sovereignty Day - has been declared, and the capital, Baghdad, threw a giant party to mark the eve of the changeover. Hours before the Monday night deadline, four US soldiers were killed in combat. US-led combat operations are due to end by September 2010, with all troops gone from Iraq by the end of 2011. The US military said the four soldiers served in Baghdad, but did not provide further details before families had been notified. 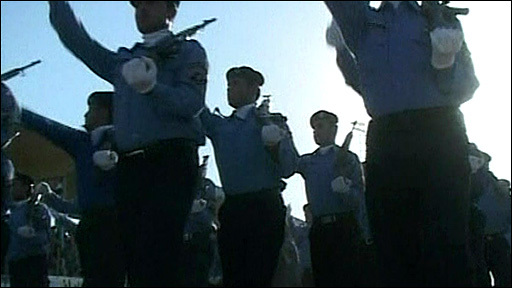 They died as a "result of combat related injuries", the military said. Iraqi and US troops have been on the alert for insurgent attacks during the handover. Despite the pullback from cities and towns, due to be completed on Tuesday, US troops will still be embedded with Iraqi forces. Both American and the Iraqi commanders say they are expecting al-Qaeda in Iraq and other groups to attempt to re-ignite sectarian tensions. BBC defence and security correspondent Rob Watson says that while the pullback is significant, the actual withdrawal of US combat troops in 2010 will pose a greater challenge. The success of that depends on Iraq's political leaders and their ability to tackle the country's many outstanding problems and tensions, he says. Some 131,000 US troops remain in Iraq, including 12 combat brigades, and the total is not expected to drop below 128,000 until after the Iraqi national election in January. Iraqi soldiers paraded through Baghdad's streets on Monday in vehicles decorated with flowers and Iraqi flags, while patriotic songs were played through loudspeakers at checkpoints. Signs were draped on some of Baghdad's concrete blast walls reading "Iraq: my nation, my glory, my honour". US commanders have said security and stability is improving, and that Iraqi forces are now ready to take over security operations. The US Ambassador to Iraq, Christopher Hill, said there would be no major reduction in forces until 2010 but the pullback was a "milestone". "Yes, we think Iraq is ready and Iraq thinks Iraq is ready," he said. "We have spent a lot of time working very closely with Iraqi security services... and I think there is an understanding that now it is the time." Mr Hill stressed that there would still be "a lot of US combat capabilities in Iraq for months to come". "After 30 June, with US combat forces out of cities and villages, localities, we'll still be in Iraq," he said. "We will still have a very robust number of US troops in Iraq and, in fact, those troops will not begin to withdraw from Iraq until probably several months from now." The pullback comes two years after the US "surge" of extra troops between February and June 2007, which saw US troop levels in Iraq reach about 170,000. There was a decline in violence, but recent months have seen an upsurge. In the past 10 days nearly 170 people have been killed and many more injured in three attacks in Baghdad and Kirkuk. Did you attend Monday's celebrations in Iraq? Send your comments or pictures using the form below.